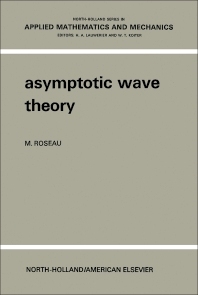 Asymptotic Wave Theory investigates the asymptotic behavior of wave representations and presents some typical results borrowed from hydrodynamics and elasticity theory. It describes techniques such as Fourier-Laplace transforms, operational calculus, special functions, and asymptotic methods. It also discusses applications to the wave equation, the elements of scattering matrix theory, problems related to the wave equation, and diffraction. Organized into eight chapters, this volume begins with an overview of the Fourier-Laplace integral, the Mellin transform, and special functions such as the gamma function and the Bessel functions. It then considers wave propagation, with emphasis on representations of plane, cylindrical or spherical waves. It methodically introduces the reader to the reflexion and refraction of a plane wave at the interface between two homogeneous media, the asymptotic expansion of Hankel's functions in the neighborhood of the point at infinity, and the asymptotic behavior of the Laplace transform. The book also examines the method of steepest descent, the asymptotic representation of Hankel's function of large order, and the scattering matrix theory. The remaining chapters focus on problems of flow in open channels, the propagation of elastic waves within a layered spherical body, and some problems in water wave theory. This book is a valuable resource for mechanics and students of applied mathematics and mechanics.